As we face a serious nursing shortage, the U.S. Bureau of Labor Statistics predicts the nation will suffer a shortfall of 1.2 million nurses by 2030. Closer to home, Texas is third among states who will suffer the most from lack of available nurses. The irony is that approximately 68,938 qualified applicants were denied admission to nursing schools, according to an American Association of Colleges of Nursing (AACN) 2014-15 enrollment report. At Texas Woman’s University (TWU), for example, nursing is one of our most competitive programs, with the grade point averages of those accepted averaging 3.6, well above the minimal 3.0. Like many nursing programs, we turn away far more applicants than we are able to accept across our three campuses in Denton, Dallas and Houston. Where nursing programs fall short is not in the number of applicants, but in the number of those qualified to teach the next generation. The average faculty vacancy is 8.3 percent (AACN report). If we had more faculty, we could bring in more students. There is an acute need to recruit and retain expanded numbers of nursing faculty; to do that, we must communicate the wonderful and fulfilling career the nurse educator role presents. 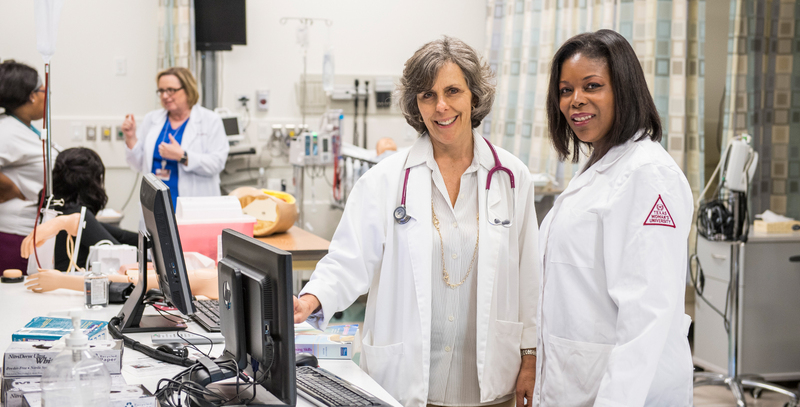 TWU has a long history preparing the nurse faculty workforce in the state, providing 24 percent of all Texas nursing doctoral degrees from four-year public universities. Recruiting nurse educators should start in the undergraduate experience, instilling dedication and commitment to the profession. Solutions to the nursing faculty shortage are linked to improving health care. Keeping nursing faculty credentialed offers opportunities to seek innovative strategies for faculty practice, joint appointments and academic-practice partnerships which advance clinical outcomes in all settings. TWU has built strong alliances with health care institutions in Denton, Dallas and Houston where students gain clinical competencies. I believe we can build on those relationships to sustain clinical competencies among nursing faculty and advance faculty-staff nurse relationships to improve not only the nursing student experience, but the patient experience as well. Many nurses are disappointed to discover that faculty salaries don’t always compare favorably with those of practicing nurses. However, we are making gains in academic compensation and academe has benefits nurses should consider. Nurse educators can combine a love of clinical practice with a passion for teaching, and play a critical role in strengthening the nursing workforce. Nurse educators can engage in scholarship, enjoy interaction with students and colleagues and work in an intellectually stimulating workplace with flexible scheduling. The career outlook for nurse educators is strong. Nursing schools nationwide are struggling to find new faculty to accommodate students’ rising interest in nursing. The nurse faculty role affords a high level of job security and provides opportunities for nurses to maintain dual roles as educators and direct patient care providers. At TWU, our nursing faculty is actively involved in research on domestic violence, emergency care outcomes, palliative care, body image, breast cancer, veterans’ and women’s health care, maternal morbidity and mortality. Through our Center for Global Nursing, faculty work with nursing educators from across the globe creating a positive impact on patient outcomes for the world. Pursuing a career in education is a personal choice. But I strongly encourage my fellow nurses in Texas to take a closer look at what you would like your legacy to be. No doubt a clinical nurse will directly affect the lives of hundreds of patients throughout his or her life’s work. But a nurse educator could indirectly affect millions. Texas Woman's University has colleges of nursing in Denton, Dallas and Houston with degree programs for Bachelor of Science with a major in Nursing, RN-BS completion, Master of Science with a Major in Nursing (Nurse Practitioner, Nursing Educator, Nursing Health Systems Management), Doctor of Nursing Practice (DNP), Doctor of Philosophy in Nursing Science (Ph.D.) and DNP to Ph.D. Bridge. Some of our programs are 100 percent online, including the RN-BS, the MS Nurse Educator Program and the Ph.D. (Denton). Find out more about our advanced practice and Ph.D. programs at http://www.twu.edu/nursing-grad.